Syrian first lady Asma al-Assad has been compared to Princess Diana for her youth, beauty and compassion. Now private e-mails leaked to the Guardian newspaper portray a woman who resembles Marie Antoinette. Since the Syrian uprising led to a brutal crackdown by President Bashar al-Assad's regime a year ago, his wife Asma has largely remained out of the spotlight, except for two public appearances supporting her husband. In January she was almost inconspicuous with a beret on her head, while clutching two of her young children and feigning a smile for the cameras as her husband gave a speech at a rally. In late February, the first lady looking more confident and elegant in black, was seen smiling and greeting supporters alongside the President as they cast ballots in a referendum on constitutional reform, which was regarded as a farce by opposition forces and condemned by the West. At the same time, the city of Homs, which has been at the epicenter of the pro-democracy movement, was bombarded with mortars and rockets. At least 8,000 Syrians have been killed in the year-long bloodbath, according to UN estimates. Earlier in February, the First Lady provoked outrage in Britain by sending an unsolicited e-mail to the Times newspaper, saying "The President is the President of Syria, not a faction of Syrians, and the First lady supports him in that role." She appears to communicate often by e-mail. On Thursday, Britain's Guardian newspaper published the first couple's private e-mail documents leaked by the opposition group Supreme Council of the Revolution. The e-mails portray a woman who ordered tens of thousands of dollars worth of chandeliers and candlesticks among other luxury items within the past eight month period, when her country was under siege and ordinary Syrians were facing food shortages. Mrs. Assad also maintained e-mail contact with the Qatar emir's daughter Hamid bin Khalifa al-Thani, who urged the first couple to leave Syria and even offered them asylum in Doha, but since then relations between the two friends have apparently chilled. 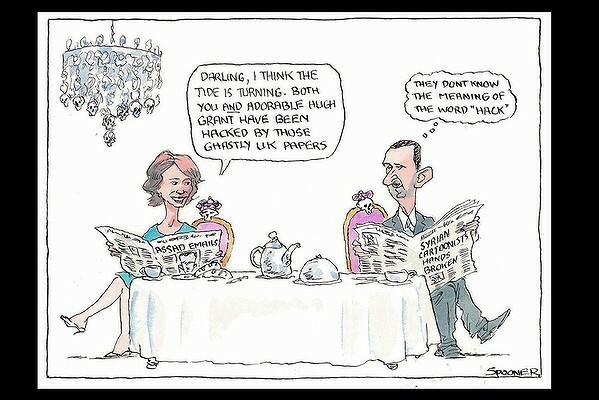 Diyab believes that the First Lady should have seized the moment during the Arab Spring upheavals a year ago and could have won the support of millions of Syrians by speaking out against the government massacre of teenage protesters in the Syrian city Deraa, whose only offence was to spray pro-democracy graffiti on walls. "She had to publicly condemn what the government is doing and I know Asma is a wife, mother of three children, but when you choose to be First Lady, you are not only playing the role of mother, wife and daughter. You have a national responsibility toward people who had faith in you as a First Lady," Diyab, who now lives in the UK, told DW. The First Lady could have been a role model for young people and women in particular, but Diyab sees a lack of moral courage. "She 's very fragile. The image of her as a Damascena rose is very her. She is not a strong woman as such, because she was born and bred in England where you don't need to show a lot of resistance to prove your point. Maybe her fragility fails her to support her nation," she said. I say her duty is to her family first, then Syria, then the world. She has clearly honored her family obligations, and as for Syria that all depends upon which side of the question the Syrians come down on, for Assad or against. As for the brits they are not going to be happy mostly, as they have in recent years again taken to loving meddling in the affairs of others an Assad is currently on the top three of their hit list. She's weak they say?? If she were weak should would have fled the country by now, this is just sour grapes...... it is the same BS we see here in American where the feminists are all for empowering women, up till the time women decide to defy the script that the feminists have laid out for them. The script now reads that women are not to stand by their men when their men are accused of crimes against women, crimes against humanity, or unapproved sexual liaisons. The choice still exists for the moment, but only one road is respectable. Women have their instructions, no matter how much a violation of their personal space these instructions are, as well as unreasonable. "a failure as a woman"? You're asking us whether she should stand by her man or not? Why is this even remotely worthy of discussion when considering the extent of the brutal oppression of ordinary citizens in Syria? So your point is that there can be no defense of Asma being unwilling to follow her instructions? Editors all around the world have decided that it is, and I am included to agree with them. To me, it's a little like asking whether Eva should have remained loyal to Adolph, or sided with the Jews in Nazi Germany or not. if you play with turds, it's very hard not to get poop on you. Even worse when you marry known turds & tie your life to theirs, Rocky! One of the most striking aspects of the emails' leak is how Assad bypassed his male aides. Instead, as his country slipped further into bloodshed, he appears to have grown reliant on media advice from a group of young, westernised Syrian expats. Most are women. At their core are Ali and her friend Sheherazad Jaafari, a former intern at the New York-based PR firm Brown Lloyd James. Of the two, Jaafari has the better connections: her father is Syria's ambassador to the UN in New York, with a hotline to Damascus. But Ali's biography and now deleted Facebook page offer clues to her rapid rise. Like Assad and much of Syria's elite, Ali is from the Alawi religious sect. She grew up in the coastal town of Qurdaha, known for its Alawite population. Why wouldn't Asma want to be married to a guy who thinks as highly of women as Bashar seems to?? Is she any worse than Nancy Reagan, either of the Bush wives, Lynn Cheney or any of the other US politicians' wives who stand by their men as they butcher innocents far and wide, MsO? Unless they happen to be the ordinary, run-of-the-mill Syrian women who would like to live with much less repression? Why does everything come down to what's wrong with women with you? Look at your thread title. What does Assad's wife's attitude about what is occurring in Syria have to do with her "failure as a woman", for heavens sake? You could have asked (if that's what you actually want to discuss?) if she could have done more to influence her husband's treatment of dissenters in Syria. Or if he could have done more to improve the lives of Syrians. But, as someone who has spent a great deal of her life in England, surely she would have noticed a huge discrepancy between her own families' wealth, life-style & freedoms compared to ordinary Syrians? I think it's reasonable to assume that they both fully accept their situation of power & privilege. It isn't as though it just happened overnight & took them by surprise! Or that she knew nothing about it before she married him. So why expect her to become some sort of reformer all of a sudden? What does Assad's wife's attitude about what is occurring in Syria have to do with her "failure as a woman", for heavens sake? The claimed failure is that she does not either leave or condemn her husband. I say that her duty to her family comes first, so she is under no obligation to do so. I further dispute the assertion that her not doing so indicates that she is weak. The debate that we have been having in America for years over the reaction of every wife of a high powered man who gets accused of sexual wrong doing has now been applied to the wives of Middle Eastern dictators. I did not invent the debate, I am simply taking a position on it and looking to see if anyone at A2K wants to join the debate. The case of Asma is especially interesting, as the brits expect her to conform to their standards on such things as human rights , seeming to forget that she is fully Syrian by family, and so far as I know Muslim as well. There are two sides to Asma al-Assad," says Tabler. "She is a modern woman, definitely apart from other wives of Arab leaders." She ran nongovernment organizations specifically geared toward the country's worst problems: high unemployment and disparity between the rich and poor. But Asma al-Assad coveted the good life too, Tabler says. "She also wanted to be a princess." Syrian expert Andrew Tabler, an American scholar and journalist who lived in Syria between 2001 and 2008. Is she better or worse than the wives of US presidents you've mentioned, JTT? Heavens, how would I know that? I'd have to know all of them personally to be able to have a go at answering that! I have responded to hawkeye's question about whether she, in particular, is a "failure as a woman" or not, for (apparently) not having exercised more influence on liberalizing Assad's internal policies in Syria. I can only speculate about whether Asma Al-Assad has attempted to influence her husband's political decision-making or not. The emails I've read in the Guardian suggest that .. well .. the plight of the Syrian people were not exactly upper-most in her concerns. Asma al-Assad has been condemned for supporting her husband, Syrian President Bashar al-Assad, as the bombardment of her family's home city, Homs, goes on. But do autocrats' wives ever rein in their husbands? The first public intervention of British-born Asma al-Assad, 36, since the uprising began in Syria nearly a year ago was an email from her office to the Times newspaper in London. It's estimated by human rights groups and activists that more than 7,000 people - 2,000 members of the security services, and 5,000 others - have been killed in the unrest, and Syrian opposition supporters promptly condemned Mrs Assad's "hypocrisy". But her stance should come as no surprise, says Rime Allaf, an associate fellow of Chatham House, the London foreign affairs think tank. "Why are we shaming her and saying she should do something? There was never any question that she would do anything else. But there have been examples where wives have stood up to their authoritarian husbands. In the early 1990s, Susana Higuchi condemned her husband, Peruvian President Alberto Fujimori, as a "tyrant" and he responded by divorcing her and giving the status of First Lady to his daughter. Columnist Yasmin Alibhai-Brown agrees that women are sometimes judged unfairly, but anyone who stands by a dishonourable man with the power to make or break a nation fully deserves blame and punishment, she says. She believes there are "true Lady Macbeths" like Madame Mao, partly responsible for the Cultural Revolution, or Mira Markovic, widow to Slobodan Milosevic and regarded as a key influence on him. But the silent wives also deserve condemnation, in her view. We don't know if they're victims. I see the difficulties for them but if something like this [in Syria] is going on, for me it's unforgivable. It could be that Asma is under terrible pressure, that she's been told that if she doesn't do this she will be in trouble. "But both Suzanne Mubarak [wife of former Egyptian President Hosni Mubarak] and Asma are powerful women. They're not put upon or oppressed women." Unlike the wife of the late Libyan leader Muammar Gaddafi, who didn't have much of a presence, others like to present themselves as modern Arab women, says Ms Alibhai-Brown. Yet they allow themselves to be silenced when they should speak out or act. "The biggest rulers in the Ottoman Empire were always very easily manipulated by their wives and mothers, so women could play a part, but since then we've gone backwards. "It can't be possible that today they are all too oppressed." I believe he likes to shop, too, dj. I guess that makes him a pretty successful at being a man. Oh I'm certain you are a very successful at being man, dj. Being a wee bit impoverished these days, I'm not half as successful at being a woman, I'm sure. You don't have to buy? But then just anyone could be successful at being men or women! » Is Asma Al-Assad a Failure as a Woman?